Carr was hurt in the third quarter against Denver. 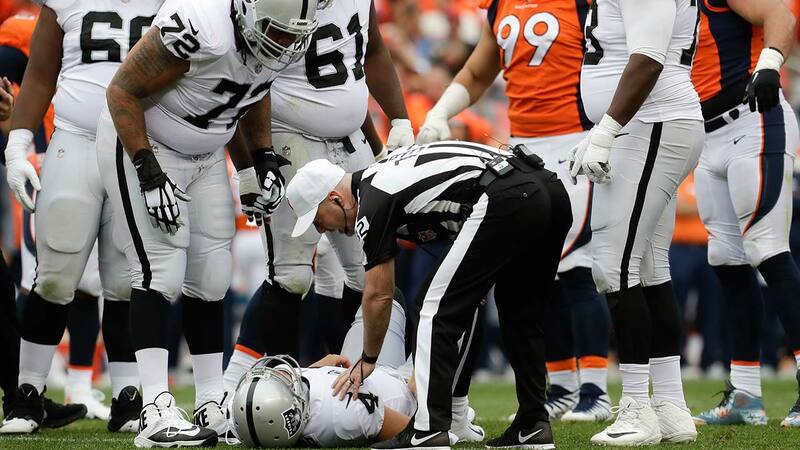 FRESNO, Calif. (KFSN) -- Raiders Quarterback Derek Carr left the game against the Broncos with a back injury. The Raiders official Twitter account confirming Carr's injury. QB Derek Carr (back) is questionable to return. After the game Raiders Head Coach Jack Del Rio said Carr was dealing with "back spasms." The former Fresno State star was hurt on a play when he was twisted up and took a knee to his back on a sack. Prior to the injury, Carr was 10-18, 143 yards with a touchdown. Carr ended last season with a broken leg in a game at home against the Colts.